Here are my grandparents Roscoe & Blanche Doty in southern Oregon in 1917. 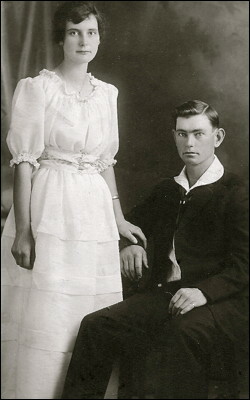 They were married in Jacksonville, Oregon on August 30, 1916. In the 1850s, Grandma Blanche's family settled at their homestead in Beagle (near Sams Valley) where Blanche was born in 1898. In 1910, after touring numerous states on dirt roads, Grandpa Roscoe rode into the Rogue Valley on the first Indian motorcycle to find its way into southern Oregon. He was 19 years old. He moved into one of the white cottages at Modoc Orchard at the base of Upper Table Rock. Within a few years, he met his future wife at a dance in Beagle. In the 1920s they built a house in Medford. The July 24, 1927 Medford Mail Tribune published this description: "Mr. and Mrs. Roscoe Doty have a neat cottage on their two acres, with honeysuckle growing about the door. A garage and chicken house are built. A garden, and some chickens, and their two boys will raise rabbits." On July 14, 2012, I stopped by a yard sale at their old home. A young couple had just moved in, fixed up the place, and we had a wonderful time sharing stories.